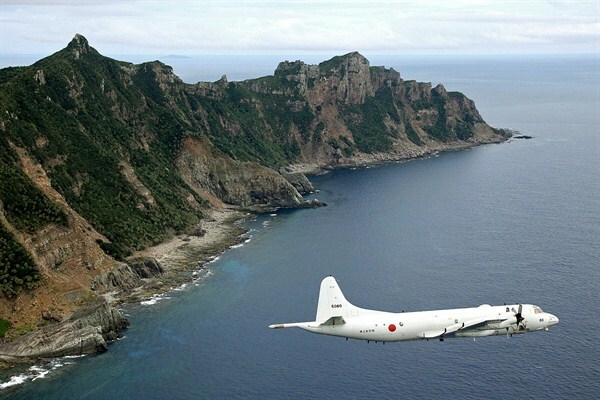 A Japanese Maritime Self-Defense Force surveillance plane flying over the disputed islands, called the Senkaku in Japan and Diaoyu in China, in the East China Sea, Oct. 13, 2011 (Kyodo News photo via AP). After meeting briefly on the sidelines of the APEC summit in Lima, Peru, last month, Chinese President Xi Jinping and Japanese Prime Minister Shinzo Abe acknowledged the need for improved ties. Despite the diplomatic gesture, though, relations remain strained. Next year marks the 45th anniversary of the normalization of diplomatic relations between Japan and the People’s Republic of China, but celebrants of that auspicious occasion may unfortunately find little reason to cheer.